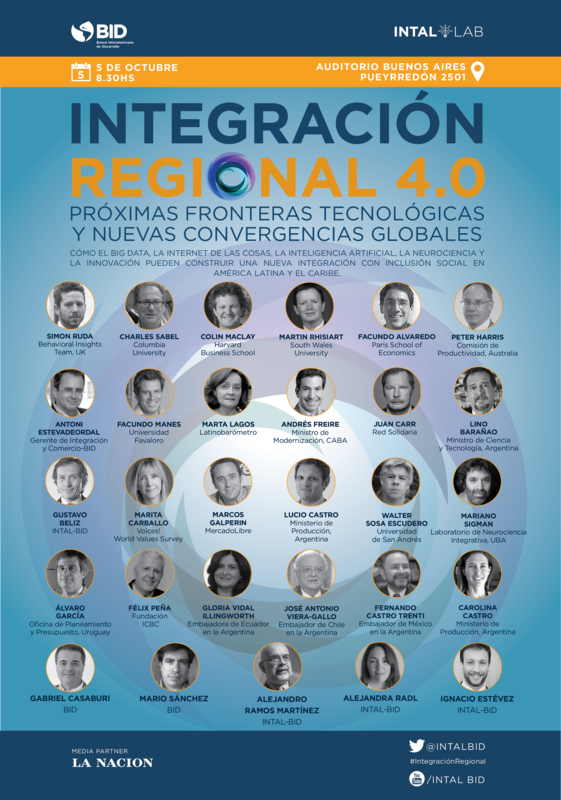 This year, the annual flagship event of the Institute for the Integration of Latin America and the Caribbean (INTAL) looked at the impact of new technologies on the transformation of the production patterns of Latin American and Caribbean countries, with the help of global experts who shared the latest developments in these areas. Just over two centuries ago, three innovations changed the world forever: the steam engine, electricity, and the telegraph. Together they gave rise to the Industrial Revolution. Today, the very sectors in which these innovations came about—transportation, energy, and communications, respectively—are going through similar exponential changes and creating a new form of industry, Industry 4.0. Exponential technologies that were often invented by creative garage entrepreneurs have started to impact the world of economics in highly varied areas, such as trade, information and communication technologies, digital manufacturing, the bioeconomy, the use of big data, or nanotechnology. For example, advances in artificial intelligence imply one of the most dizzying challenges of our time: robots have started to compete for our jobs. We are learning to manufacture automated, independent minds that will be capable of doing our work and replacing us. The International Federation of Robotics estimates that by 2018 there will be over 1.3 million industrial robots operating in factories around the world. In some countries, up to 85% of manufacturing jobs may be replaced (link in Spanish) by machines. The potential impact these technologies may have on labor markets and income distribution could be highly significant. Many jobs, especially those requiring lower skills and paying lower salaries, may disappear as a result of automation (Frey and Osborne, 2014; WEF, 2015). Productivity is on the rise, but so is unemployment, partly because of technological progress . The speed at which technology is developing and moving forward, creating new realities of life (and new problems), isn’t giving us time to come up with appropriate solutions fast enough. How long will it take for autonomous cars and trucks to become widespread? Or for 4D printing to put paid to the high costs of logistics, transportation, and warehousing through the rise of DIY philosophy and maker mentality? When will renewable energies replace oil? The spread of autonomous vehicles will entail major modifications to legislation on vehicle safety standards and the protection of privacy, among other factors (Van Woensel and Archer, 2015). If such changes are not coordinated at the international level, legislative differences could become technical barriers to trade (TBTs). Another example is the sharing economy, which venture capital expert and enthusiastic start-up investor Shervin Pishevar predicts may become as significant as the Internet. Companies in the tourism sector (Airbnb, CouchSurfing, or Homeaway), transportation (Uber, Lyft, or Bla Bla Car), the entertainment industry (Netflix, Amazon Library, or Spotify), or online marketplaces (Wallapop or eBay) have created large new markets in a short time solely on the basis of connectivity. According to the report “Economía colaborativa en América Latina [The sharing economy in Latin America]”, the number of sharing economy initiatives in the region are concentrated in a handful of countries, led by Brazil (32%), followed by Argentina (13%), Mexico (13%), and Peru (11%). There is no doubt that the sharing economy is transforming the service sector and will also affect employment. The key will lie in developing tools that allow us to harness new technologies, take advantage of the employment potential that is emerging in these new sectors, provide legal protection for different forms of employment, and foster harmonious, balanced relationships between different social players . The new industrial revolution is blurring the boundary between goods and services and bringing about a true metamorphosis in the shape of global trade, with increasingly complex and sophisticated global value chains. October 5, 2016 / Buenos Aires, Argentina. Nicolini, Cecilia. 2016. “ROBOTlution: The Empowerment of Machines.” INTAL Connection no. 239. Economía colaborativa en América Latina. IE Business School; FOMIN, 2016. Fabio Bertranou in: Economía colaborativa en América Latina. IE Business School; FOMIN, 2016.